Drill hole in both pieces of stock, after clamping them together. Hole should be smaller than root of wood screw thread below shank. Drill to about x/4 inch of bottom of bottom piece of stock (left). Use counterbore for plug hole (same size, of course). Counterbore % inch deep in drilled hole. Note: Always index stock across both pieces by pencil marks for re-assembly of pieces. Unclamp stock. Glue both faces. Assemble. Run wood screw home with screw driver tight enough to draw stock together. Wipe bottom end of plug with glue and put some on lower edges. Place in hole over screw and tap home. Let glue set and pare off top of plug. Be sure grain of plug and stock run the same way-always (right). If you are going to joint two sides of stock edgewise, care must be taken to see that both sides are planed flat, square, and straight. This is best done with the 18-inch jointer plane. It will take a considerable amount of practice to be able to do this. A good edge joint is one where both edges are perfectly square with the face of the stock, where the ends touch each other for about two-thirds of the length of the pieces and where there is a thin gap in the center of the joint when the two pieces are placed one on the other vertically the gap in the center being about the thickness of a cigarette paper-no more. Jointing the edge of a 2-inch mahogany plank. Note the slight skew the jointer plane makes with the stock. Set the plane blade fine for this process. To glue two pieces of stock together edgewise, it is necessary to use long clamps. Specially designed fixtures are available today that fit on short or long pieces of galvanized iron pipe. These pairs of devices, together with a suitable length of pipe, make excellent clamps for shop use. There is a trick in setting your clamps on the stock to get the best results. On any longitudinal joint up to 4 feet, I have found that the best results are obtained by setting the clamps in from each end a distance of 8 or 9 inches. Clamps so placed will pull all parts of the joint tightly together, and there is enough spring in the stock so that the narrow gap in the center of the joint will be drawn up tightly. To avoid crushing the edge grain of your carving blank, put a small piece of stock (I use clipped ends of untempered Prestwood for the purpose) between the inside faces of the jaws of the clamps and the edges of the stock. To prevent the stock from twisting or curling out of the clamps, I usually use small hand clamps set over the joint at either end of the piece. 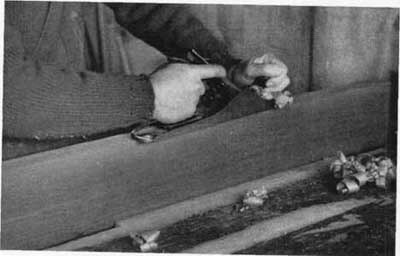 To be sure that the clamps are not glued to the wood, put squares of paper over the joints, back these up with the Prestwood clips, "put the squeeze on," and you are sure that the two pieces will stay put. Another thing that may be useful to do is to slip pieces of newspaper in between the pipe and the glued joint. This avoids the possibility of the stock becoming glued to the pipe after the glue is set. Do not be afraid to squeeze the two pieces of stock tightly together. The tighter the clamps, the better the result. If you have made your joints square and a good fit, the amount of glue that is squeezed out from the joint after you have set up the pipe clamp should be about the same all along the joint on both sides. Stock in clamps after jointing and gluing up. 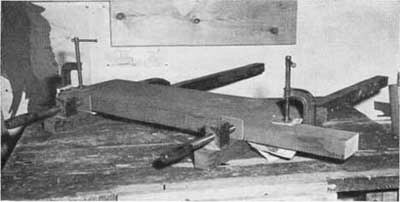 Note the clipped stock between the plank and the various clamps, also the bits of paper. The "C" clamps prevent the stock from curling out of the large ones. One tip about reglueing a piece if you have to, for some reason or another. Always wash off, with very hot water, all the glue that has been applied. Set the pieces aside to dry thoroughly and, after they have dried, correct the error of fit or whatever it is that must be done. Then follow out the glueing and clamping procedures as before. Don't try to work wet or damp stock. Anything you do under these conditions will be distorted when the stock dries. Wood always swells out of line when w7et or damp. I have used a number of different glues. The old-fashioned hot glue is messy, hard to work, and is not water resisting. The best glue that I have used so far is Weldwood water-resisting glue. It was, perhaps at one time, called waterproof glue. I am frank to confess that I have not used the presently available instant-set contact glue. Whether it's because I am of the school that believes that two glued faces should be rotated about one another to get a good spread or that I am old-fashioned, I wouldn't know. Both, maybe. Be that as it may, some of my carvings have been in the weather for eight years and they are still in one piece so far as I know. It well may be that I am harping on one string too long, but- again I want to emphasize-don't try to hurry work along. Plan the various steps so that you don't have to rush to get the work done. By that I don't mean that you should sit on your hands and do a lot of wishful thinking, either.